There’s a little contest going on over at my Facebook page: when I hit 500 “likes” on that page, I’ll give TWO people a paperback copy of both Sewerville and Lost Change and Loose Cousins! When the page hits 500, I’ll put everybody in the drawing, pull out the two random winners, and then notify them via Facebook message. As I type this, there are 400+ likes on the page already, so get over there. Click the big “thumbs up” and let’s do this thing! LOST CHANGE AND LOOSE COUSINS – get it! The new book is now available! Lost Change and Loose Cousins is out in E-book now, paperback shortly, and when the paperback is released it will have an additional story – “Philosopher Dog,” by yours truly. Strother Kevin Hall and I are happy to share this one with you. Go now, friends, and get the book here. And as always, please consider posting an Amazon and Goodreads your review of Sewerville, Lost Change and Loose Cousins, and anything else you read. As mentioned before, it’s a mix of new stuff and previously released. I will say, “Apep” and Philosopher Dog are my two personal favorites, and since those are both part of the new stuff, that ought to be all the incentive you need to buy the book. I may also include a little something called “Me and Pookie Down by the Meth Shack” if it’s finished in time. We’ll see. Okay, folks — I’m happy to say, it looks like the next book will release in June. 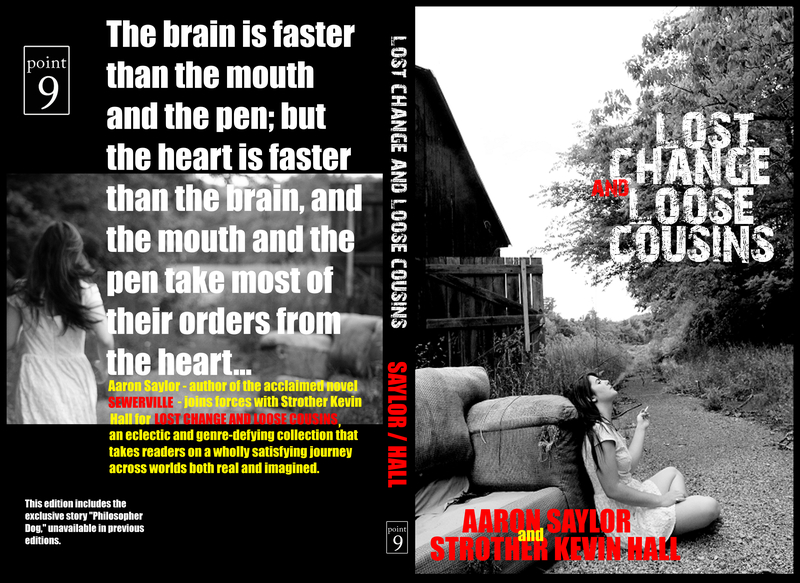 Lost Change and Loose Cousins is a collection of short stories, essays, and other etcetera by both yours truly and Kevin Hall. Some of the material has seen previous e-release – like “The Dead on Black River” and “The Sweet Smell of Pine Needles” – but there is plenty of new stuff in there, too. I’m excited to finally share it with you. More details will follow over the next few weeks. In the meantime LIKE and SHARE with all your friends on the interwebs (Twitter, Facebook, WordPress, wherever)! Goodreads poll – Sewerville as a read of the month for June? Everybody – Sewerville has been nominated as the June read of the month in the Goodreads reading group On the Southern Literary Trail. I thought it was nice to be nominated in a reading group centered around Southern literature, which is exactly the target audience for the novel. Goodreads is a gigantic website, with tons of information for book fans of all stripes. If you already use Goodreads, consider voting for Sewerville; if you haven’t joined the site yet, this is a perfect excuse! Voting ends April 28. Roger Ebert died today, as many if not most of you have already heard. There have been thousands of news reports and blog posts in the wake of his passing, and there’s probably nothing I can say that hasn’t been said already. For people who love film, and writing about film, and writing about anything, the man was a giant of our culture. I have long believed that he was one of the best writers working in the last 50 years. He was a huge influence on me, both in terms of my love for movies and also my own writing. It is perhaps cliché to suggest it, but since cancer took his ability to speak a few years ago, he still spoke to more people than ever before through his work in print and on his blog. Perhaps cliché – but no less truth. He will be missed. On a minor note, that last episode of The Walking Dead Season 3 was a little underwhelming. It didn’t solve a lot, and it didn’t leave much of a cliffhanger. Still a great show, but I personally liked Season 2 better. On another minor note, and speaking of Season 2, Season 2 of The Killing is available on Netflix now. I’ve started catching up on that, since a latecoming Season 3 will finally debut this year. If you haven’t yet watched The Killing, give it a shot. Once you get past the fact there are practically no recognizable faces in the cast (although the lead actress is starring in World War Z and her onscreen partner plays RoboCop in next year’s remake), you’ll find a great drama. Go now. On a major note — major for me, anyway — I have it on good authority that a new book with my name on it will be out by summer. More news to come over the next few weeks.